The best spice racks for your kitchen: Keep your spices in check and save money! Spice jars are the peskiest thing to try and keep track of in your kitchen right? You know the drill, you try and stand them all up neatly in a cabinet or lie them in a drawer. But they get all crowded up and roll around and you can never find what you need. So you pick up more spices at the store… only to lose them again. And before you know it you’re in the middle of a baking session and realise you have four bottles of thyme but no cinnamon! It’s time to stop those spice jars from misbehaving! Today we’re sharing our pick of the BEST spice racks for your kitchen. You’ll be shocked at how much money you save when you can actually FIND your spices! At last! 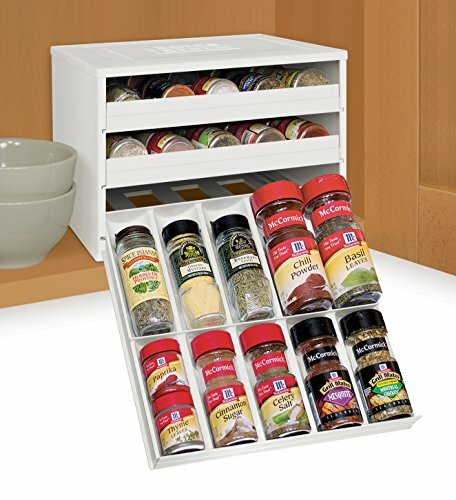 Store your spices in a drawer without them rolling around! 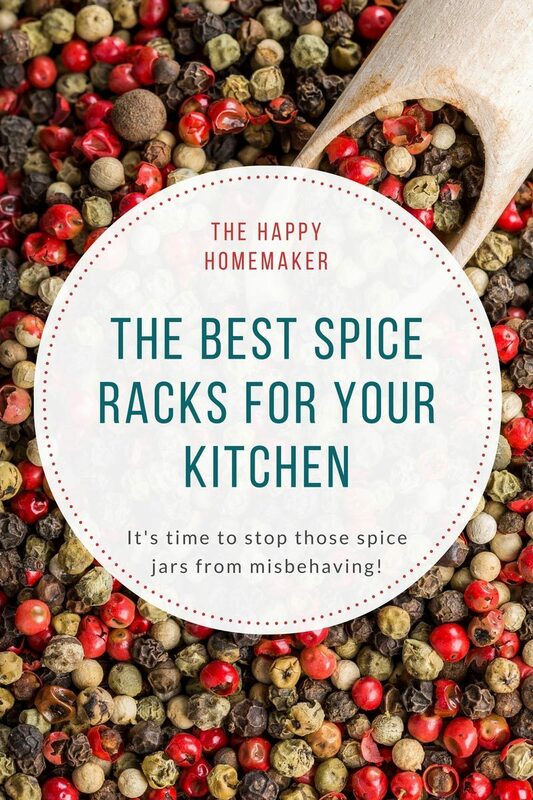 If you already have an extensive collection of herbs and spices what you need is one of these spice racks without spices just to keep all of those bottles under control! 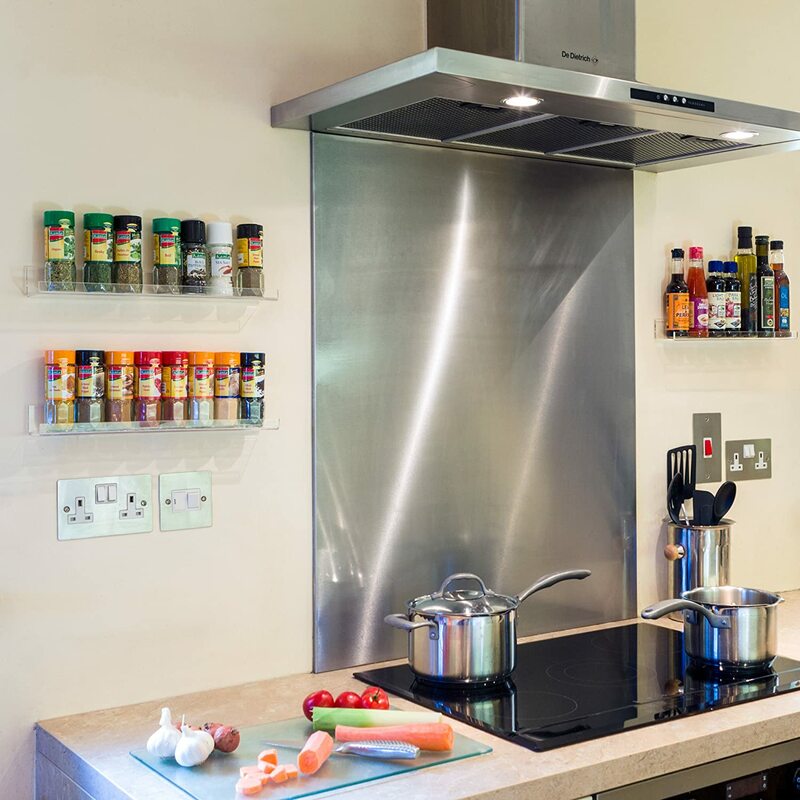 Cabinet spice racks are perfect for maximising storage space and helping you find the spice you want quickly and easily. This tiered rack has four levels and comes with 96 stickers for you to label your bottle lids so you can see what’s what. It measures 10-3/4 inches deep by 11-3/8 inches wide and 3-3/4 inches high and is made of durable ABS plastic. It’s freestanding so you don’t need to mount it to your cabinet. 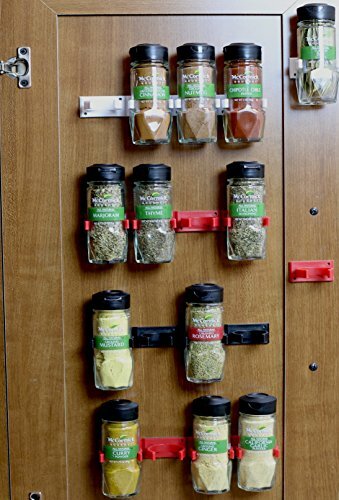 The SpiceSteps rack holds 24 regular sized spice bottles across the four racks, but you can also use it for cans, jars and even baby food! 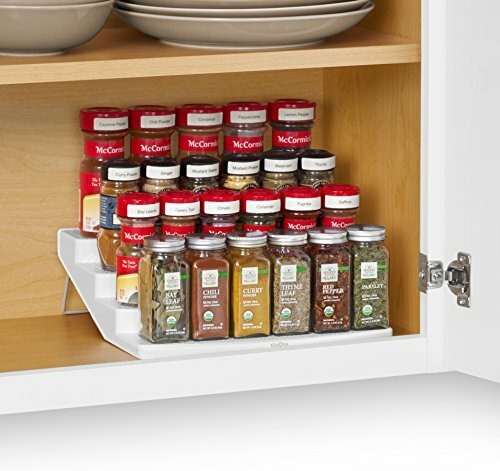 At this price you’ll be wanting to organize more than just your spices! If you’re looking for cabinet spice racks but you struggle to reach your wall cabinets to see what’s inside them then check out this clever solution; a tiered rack that pulls down for easier access! If you’re tall then you can even attach this to the top shelf of your wall cabinets. Just make sure you add a bracket to the top shelf to hold it in place or it will flip down with the spice rack! It comes in three colour options: black, white or chrome with clear shelves and measures 14.5 inches wide by 10 inches deep by 9 inches tall. It does need to be mounted to your cabinet and all of the fixings are included. This rack can hold 21 of the McCormick glass spice jars. If you love the idea of a pull down spice rack but you don’t want to mount anything to the inside of your kitchen cabinets then check out this pull out and lower drawer system instead. It comes in four different sizes allowing you to store 12, 18, 24 or 30 regular sized spice bottles. It’s a sturdy box unit which is why it doesn’t need to be mounted, but the drawers pull out and then lower down so you can easily see your spice bottles. And you don’t have to worry about having a photographic memory to remember which spice is in which drawer because it comes with 48 printed and 48 blank labels for you to stick on the drawers. Each drawer holds two rows of spices and the top row is slightly taller so you can fit 5.5 inch tall by 2.2 inch wide bottles in the top row and 4.7 inches tall by 2.2 inches wide bottles in the bottom row. You can also use it to store half jars, just stack one on top of the other in a row. 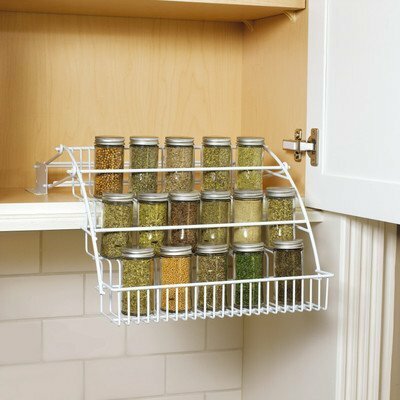 If your budget is tight and you’re looking for cheap spice racks this one is a great option. It’s a simple set of gripper strips that you stick to the inside of your cabinet door, or the side of your oven housing or even a wall. They are backed with adhesive so you just stick them on, but screws are included if you want to use them for extra security. Each gripper holds five regular sized spice bottles (not the Costco super-sized ones!) so one set of six strips (two black, two white and two red) will hold a total of 30 bottles. The only downside is that they aren’t too pretty to look at (and personally I’m not crazy about having three different colours), but when they’re inside a cabinet door no one is going to see them anyway! They are easy to to fit, and easy to use and the perfect way to organize your spices without breaking the bank. 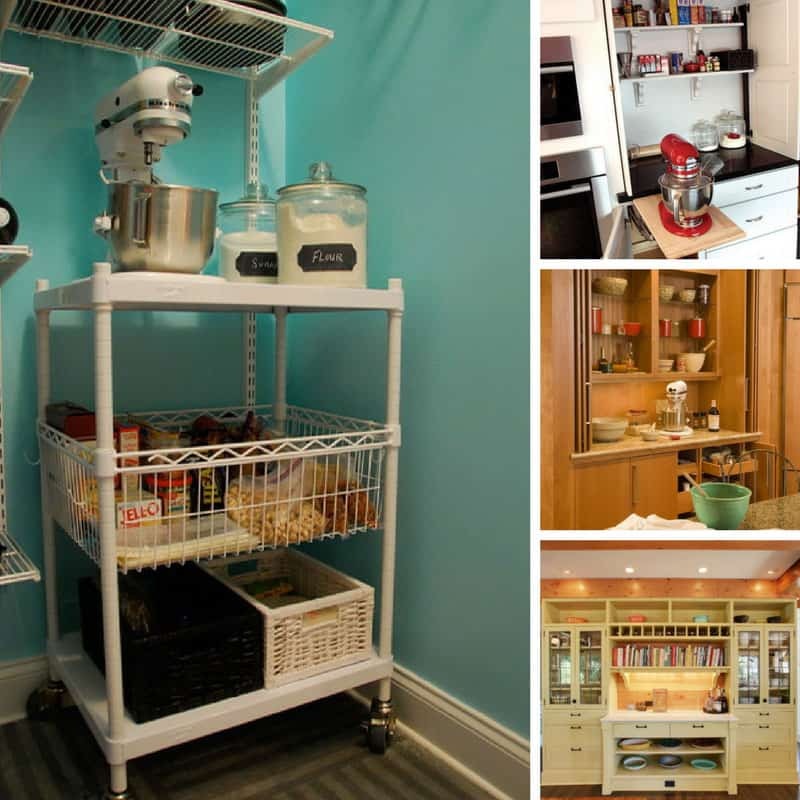 If you want to take advantage of that dead space inside your cabinet but you still want your spice rack to look pretty then try one of these door spice racks instead. 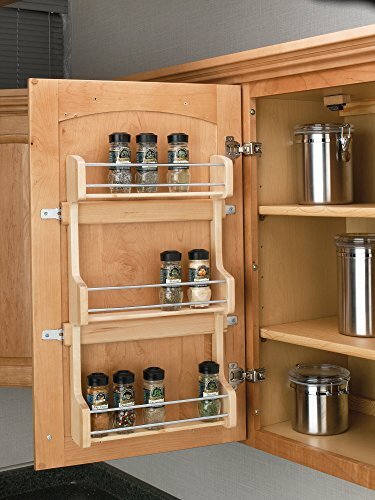 This wooden spice rack has chrome rails and mounting hardware so it looks great, and it mounts to the inside of your cabinet door with just four screws. The mounting hardware is adjustable so you can attach it to the strongest part of the door. The rack comes in three different widths so make sure you select the correct one for your cabinet. And also bear in mind that the shelves on the rack are fixed, so depending on how you have the shelves in your cabinet set up you might need to move them up or down a notch to fit the rack. 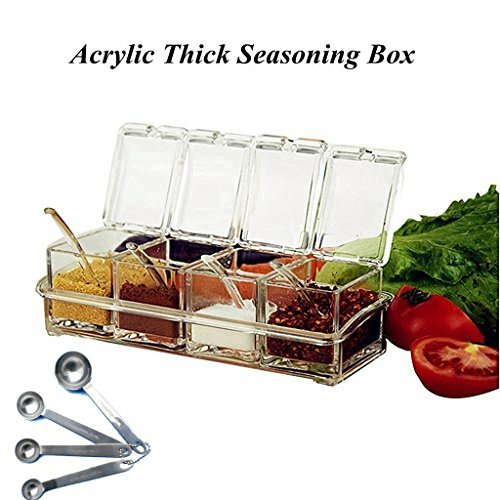 Whether you only have a small collection of spices, or you have 3-4 that you use regularly and want to keep them right next to your stove this acrylic spice rack is perfect for the job! The acrylic stand holds four lidded pots that each measure 3×2.2×2.8 inches, so they’re perfect for kosher salt, garlic powder, red pepper flakes or any other herb or spice you use every time you cook. Heck they’re even a great way for storing ketchup, mayonnaise and other condiments that your family uses at meal times. And if you’re into tea then it makes a great tea bar for your custom blends! This spice rack even comes with a set of measuring spoons. 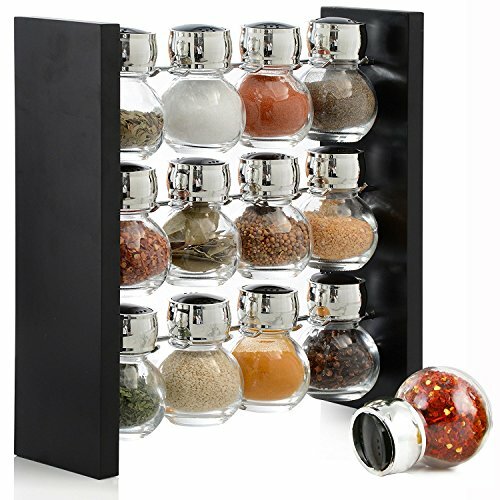 If you are looking for a way to use the empty wall space either side of your stove or even under your wall cabinets then take a look at this invisible wall spice rack. It’s made from acrylic so you don’t have to worry about it tarnishing or peeling. Also it’s one piece of acrylic that has been moulded into a shelf shape, rather than cut and glued together, which means it’s extra sturdy. Because the acrylic is transparent the shelves appear to float which is a pretty cool effect and means it fits with any colour scheme. You can use the shelves to keep your herbs and spices in easy reach but also on display. And it’s easy to see through the shelf edge to read the labels. 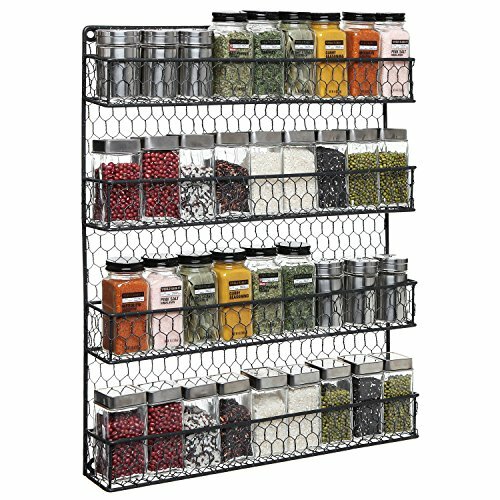 The great thing about this spice organizer is that the shelves are deeper than a spice bottle so you can use it for larger (Costco style) bottles, sauces and condiments too. There are three 15 inch wide by 2 inch (internal) deep shelves in each box and it’s up to you whether you fix them up in a row or zone above the other. 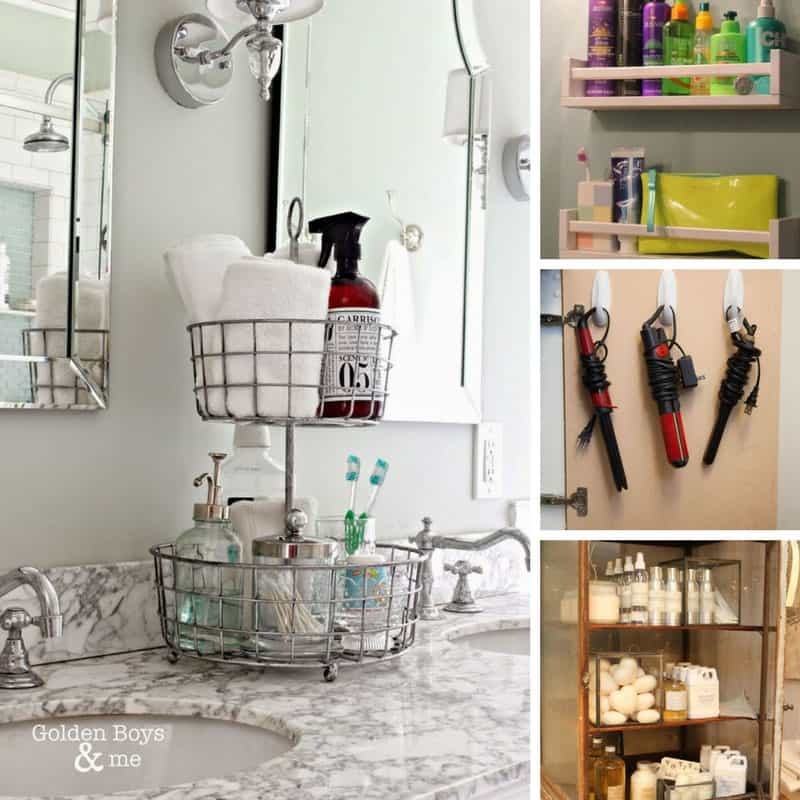 We love flexible storage solutions! It is designed to be fixed to the wall with screws which are included, though someone did come up with the clever idea of using adhesive magnets to attach their shelves to the refrigerator! The only downside to this wall spice rack is that the ends are open so if you’re not too careful the end bottle can fall off. If you’re looking for wall spice racks but your kitchen style doesn’t really suit modern acrylic shelves take a look at this country cottage style organizer instead. 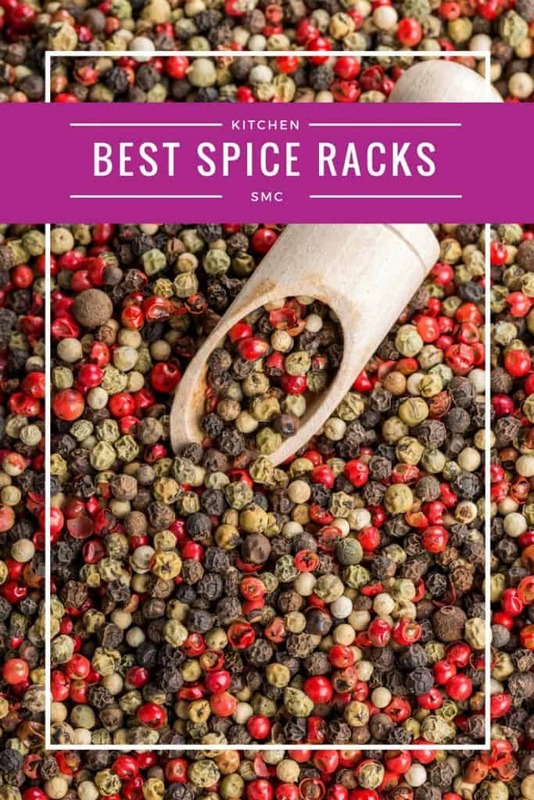 It comes in black, grey and white colour options and can be mounted to a wall, cabinet or pantry storage rack depending on where you want to store your spices. It has four shelves that will hold standard sized spice jars and measures 17 inches wide by 20.75 inches tall by 2.25 inches deep. The height of each shelf is 5.25 inches. If you like your spice jars to all look identical then spice racks with spices included are a good option. There aren’t as many to choose from as spice racks without spices but I was able to track down a few really attractive ones. Revolving spice racks are a great way to save space either in your cabinet or out on the counter. This one from Cole & Mason is a beautiful design. The jars are made from glass and the chrome plated plastic tops have both a pour and a shaker option. The spices are included and the name of each spice is etched into the lid so you won’t get them muddled up. Each jar holds 2.5 ounces of spice (that’s about 1/4 of a cup) and they are dishwasher safe and refillable. It comes in three different sizes depending on whether you need 10, 16 or 20 spices. 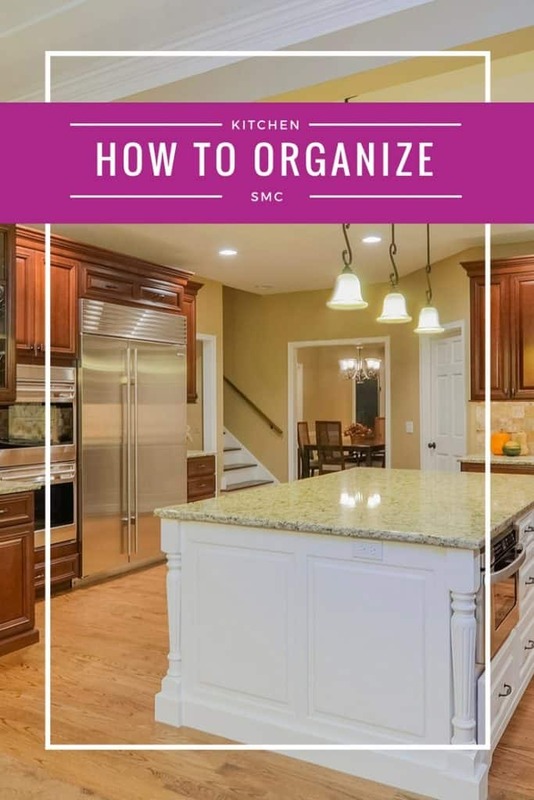 Even the largest model is compact at just 12 inches high by 9 inches wide so it won’t take up a lot of room in your cabinet and will fit neatly under your cabinet on your counter if that’s where you prefer to place it. One thing you do need to be aware of is that these bottles are designed for pouring or shaking your spices. The necks of the bottles are pretty narrow (in order for them to hang nicely on the revolving spice rack) so you won’t be able to get a spoon in there if you prefer to scoop your spices. I thought there had to be some sort of catch when I saw this spice rack because not only are the spices included they also offer free refills for five years! It’s a legitimate offer though and popular with Amazon customers. The organizer itself is a magnetic strip with metal pots that stick to it. You can attach the strip to anything metal (like the refrigerator) or you can use the screws to attach it to the wall or your cabinet instead. The jars hold three ounces of spices and you can see through the sift or pour lid so they look really colourful in your kitchen. Jar labels are included so you don’t have to remember which spice is in which pot! I’m including this one here because while it doesn’t actually come with spices it does come with the jars so if you want all your jars to look the same this is a great option. It looks really smart with the rounded crystal glass bottles and it’s sleek so it doesn’t take up too much space on the counter. 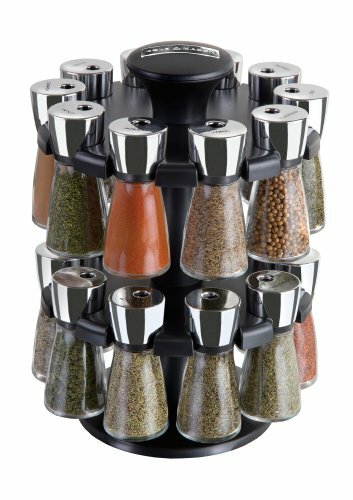 The only downside to this countertop organizer is that there are no labels included so you’d need to buy some thin ones yourself, unless you could remember which spice was which. 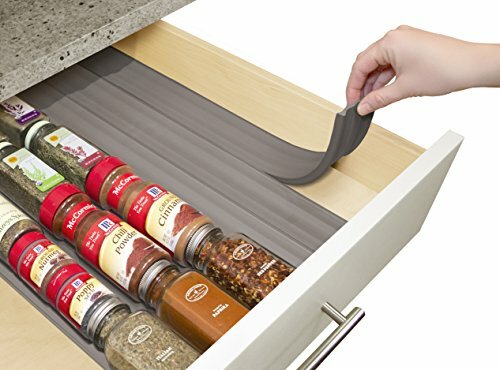 If you have a drawer going spare it’s actually the perfect place to store your spices with one of these handy drawer spice organizers. This is such a clever way to hold 24 spice bottles in place in a drawer and it doesn’t need to be permanently mounted. 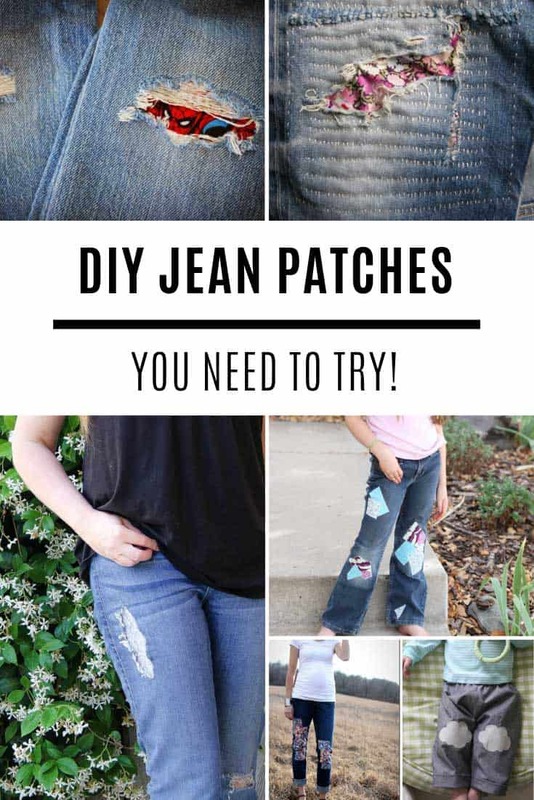 The liners are 2.5 inches wide and 18 inches long and there are six in a packet, you simply need to trim them with scissors to fit the length of your drawer, lay them in place and then put your spice jars in! They’re made of soft foam to protect your bottles and keep them in place so that you can easily see the labels. Sometimes the simplest solutions are the best ones! If you need a cheap spice rack for your drawer then this is the absolute best choice for you! 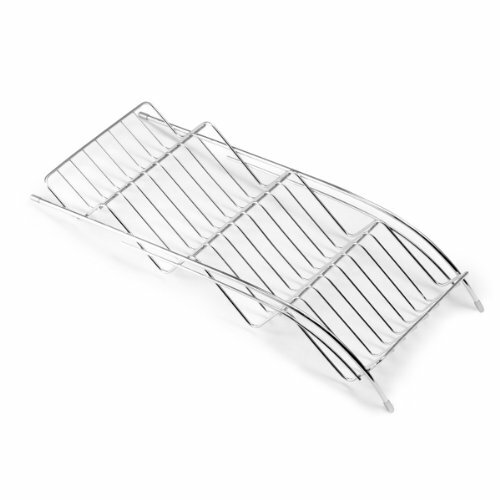 The tiered rack is made from steel and is designed to fit inside most standard sized drawers. It measures 8.5 inches wide by 18.5 inches wide and 2.5 inches high so you might even be able to fit two in your drawer side by side. And there you have it. Our picks of the best spice racks for your kitchen, from cabinet spice racks to drawer spice racks and every thing in between!